Next Saturday (Dec. 4th), we officially start our 4th year of winter workouts in the Gamers program. We are continually tweaking details of the program, to make the training more effective and to make it better and better every year. So, there are a few changes in store for this winter. The baseball skills and fundamentals taught are based on what is successful at the highest level of baseball. All age groups, from 12u to 18u, are taught the same skills and fundamentals. The 3 1/2 hours on Saturday and 2 1/2 hour rep sessions are quick paced, intense workouts. The coaching and instruction is the best available, and there is a lot of it. Four Gamers directors (Whiteside, Cooper, Pregon and Gallion) and 3 lead instructors (Beckmann, Wheeler, Rosen) lead Saturday practices. This is in addition to 4 team coaches at each age group. Performance training is built into the program, because you must first be a good athlete before you can become a good baseball player. The Gamers life lesson program is weaved throughout the 12 weeks of winter workouts. Attend every session on Saturdays and rep sessions. If they need to miss a time slot, they make it up by attending another time slot on Saturdays or another team’s rep session. Show up properly hydrated and fueled, with a healthy snack to eat on Saturdays before the Hammerbodies session. Listen and apply instruction, even if it feels uncomfortable at first. Work hard and stay focused, even if a coach is not watching. Are engaged and energetic during the workout — we love high energy players who want to get better. Show up on time, with the proper workout uniform and looking like a Gamer. If a player does those six things, he will have great winter experience and significantly improve his baseball skills. During the offseason training clinic for 15-17u Gamers, I talked about the “90th percentile” rule. 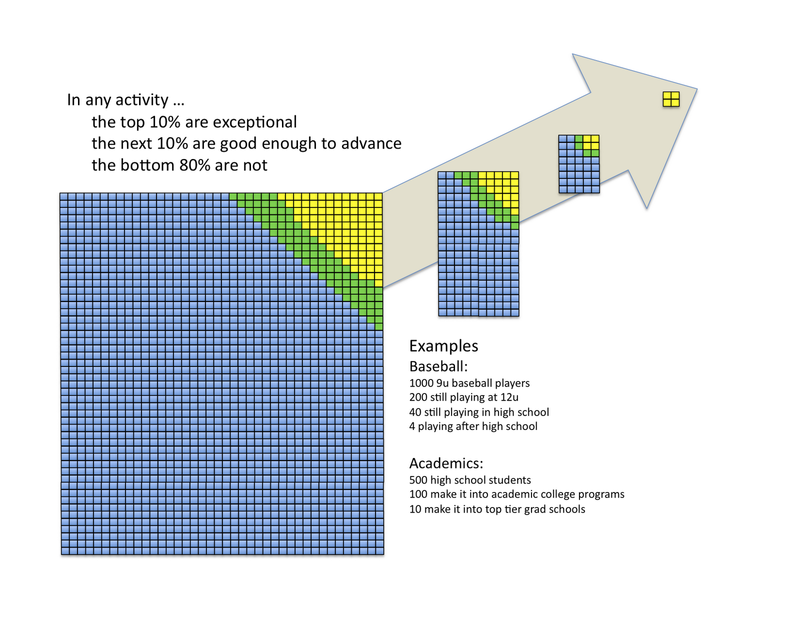 Simply put, to be extraordinary in something, you need to be in the 90th percentile (i.e. in the top 10%). To be extraordinary is not easy — you need to be firing on all cylinders to achieve this level. This is true in sports, academics or whatever endeavor you choose. And, natural talent alone is rarely enough to keep you in the top 10% — there are a lot of talented people in the world. The graphic below is a little scary — for every 1000 kids that start out playing youth baseball at 9u, only four will go on to play college baseball. It is important for Gamers to understand this graphic. In 2010, we sent 23 players on to play college baseball — they were the exceptional ones that made through, representing 6000 kids playing 9u baseball in 2001. Is the Gamers Program too "hard"
There is a lot commonality in all these statements. First, the word “just” comes up time after time. This can sometimes be an honest word. For example, when a player has made a tradeoff between a lower priority thing (baseball) and a higher priority thing (another sport? ), and baseball is “just” not that important to him any more. Or, sometimes “just” can be a very dangerous word that establishes artificial limits on effort and commitment, like “Little Johnny just doesn’t want to work that hard”. Very few people in life are successful by “just” doing something. Success requires extraordinary effort, commitment and passion. The word “just” does not fit with success. Not enough people are willing to be honest with kids and parents about this point. “Just” and “success” do not fit. By “just” doing something, you are choosing to fail. You are either committed, or you are not. This is true in baseball and in life. We have dozens of players and families who successfully manage to fit Gamers baseball around incredibly demanding family, academic and other sport schedules. The lessons of commitment, of not settling for “just” tradeoffs, pay enormous dividends in all aspects of life. The other commonality in the statements above is the seemingly opposite relationship between “fun” and “hard work”. This is also very dangerous. Being mediocre in anything, especially baseball, is not “fun”. Sometimes, the teenage boy definition of “fun” is warped and looks a lot like laziness. A lot of bad things can happen when teenage boys pursue this brand of “fun”. Pursuit of this “fun” is a dead end path. To accept mediocrity as a tradeoff for superficial teenager “fun” is sad, immature and destructive. Young men should not be allowed to make this mistake. It is not “fun” to be irresponsible, lazy and disrespectful. It might feel good for a while, but it is not “fun”. There is a different kind of “fun”, one that is sustainable, rewarding and does not come at others’ expense. This is a true “fun”, that comes from working hard, with others, towards a common goal. The dialogue above is why the Gamers program is structured the way that it is. Our program was well thought out, not a random collection of ideas and buzzwords. It was never meant to be “just” baseball. It was never meant for players that have “fun” being mediocre. Over the years, we have made some adjustments and changes to the program and will continue to do so. And, we make some mistakes, like all passionate, hard working people do. But, our principles will not change. Our program is built on the foundation that success is the direct result of passion, effort and teamwork. This is true in baseball, and it is true in life. The Gamers program is not easy, because success is never easy. Our program is designed for players who want to be exceptional and learn what it takes to be exceptional. It is not easy to be exceptional — average people are not exceptional. And, “just” being a talented baseball player or athlete is not good enough. It does not make you exceptional. A youth sports program that has the courage to follow and teach these principles can have a profound impact on young men, on the field and off. But, it takes courage and conviction to follow these principle — anything else is “just” a compromise.